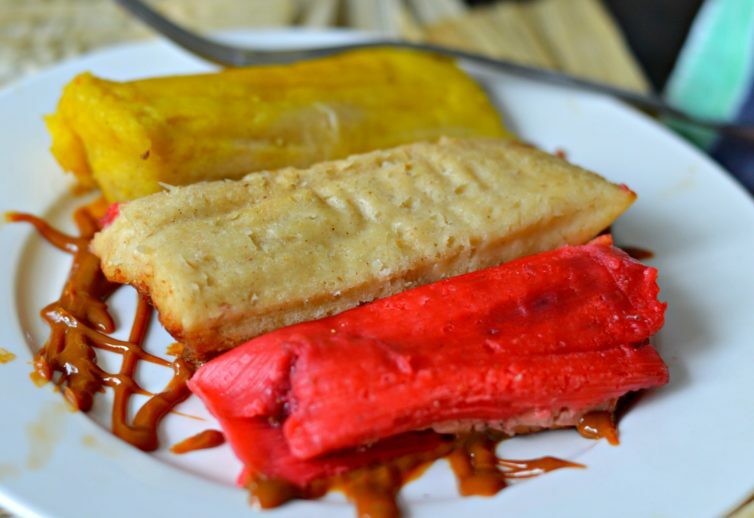 Inside: If you love Tamales, then you will want to try these three different varieties of sweet tamales as soon as possible. Looking for savory tamales? Click here. Sweet tamales are very popular in the streets of Mexico. They come in many different flavors and colors. They are great to eat with family and friends accompanied with atole or hot chocolate on a cool day. That said, you can eat these pretty much any time and you will be happy! 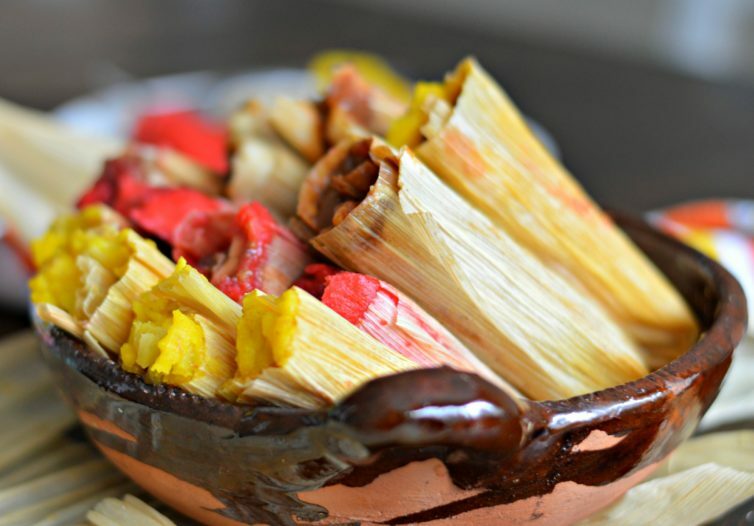 On the Dia de la Candelaria, everywhere you look is filled with tamales, sweet and savory. 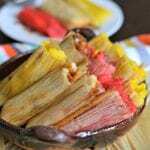 You can find them filled with pork, beef, chicken, and of course any number of sweet flavors such as strawberry, pineapple, and dulce de leche. The reason for that is because of the Dia de Los Reyes celebration, in which everyone that cuts into the Rosca de Reyes and pulls out a baby Jesus figurine is required to make tamales for everyone else on the Dia de la Candelaria! Of course, everyone has their own tastes, and some people like sweet tamales more than savory tamales and vice versa. Personally, I love both varieties, but my husband prefers the sweet tamales. 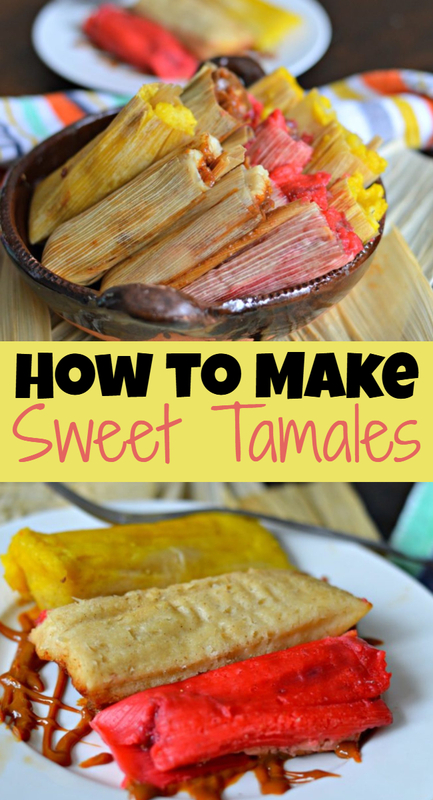 How Do You Make Sweet Tamales? 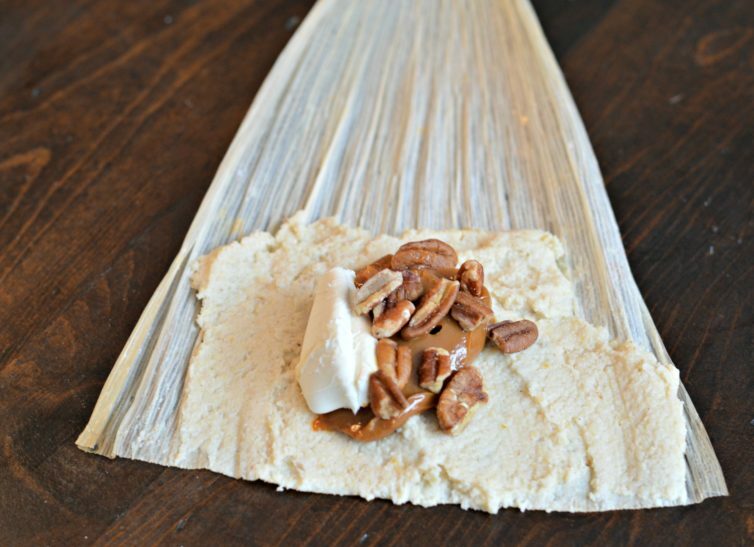 When making sweet tamales, you will use the same masa, or dough, as you do for savory tamales. However, how you prepare that dough is quite different. In order for the masa to be sweet, you will use a combination of butter, sugar, cinnamon, and vanilla. Then, we add different fillings to create different sweet flavors. This time, I made three varieties: pineapple and raisin, strawberry with strawberry preserves and cream cheese, and of course, my favorite, dulce de leche with pecans and cream cheese. Although I love these flavors, there are really infinite possibilities including chocolate, peach, apples, and blueberries to name a few. Tamales always taste better when you make them with recently ground masa. That said, it can be very difficult to find that if you live outside of Mexico like I do. I personally can only purchase masa at a Mexican market that is about an hour away from my house, so it can be difficult to get it when I need it. However, just like I shared in my savory tamales recipe, you can substitute freshly ground masa with flour for tamales from the store and they will still turn out great. I love this recipe because it let me share my traditions with my family. Making tamales can be difficult and it takes time, but it is much easier when everyone pitches in and helps to fill them, roll them, and put them in the steamer! 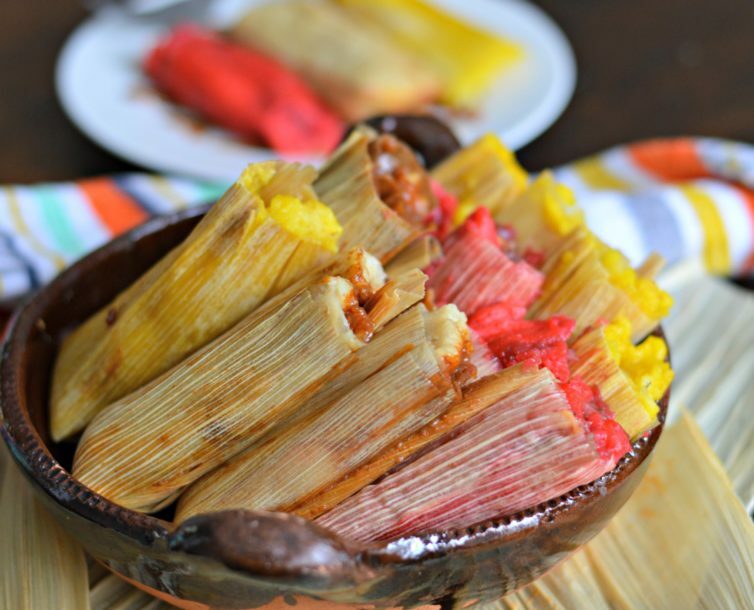 These tamales are without a doubt proof that Mexican cuisine is one of the best in the world! Don’t forget to try these and tell me how they turn out in the comments below. 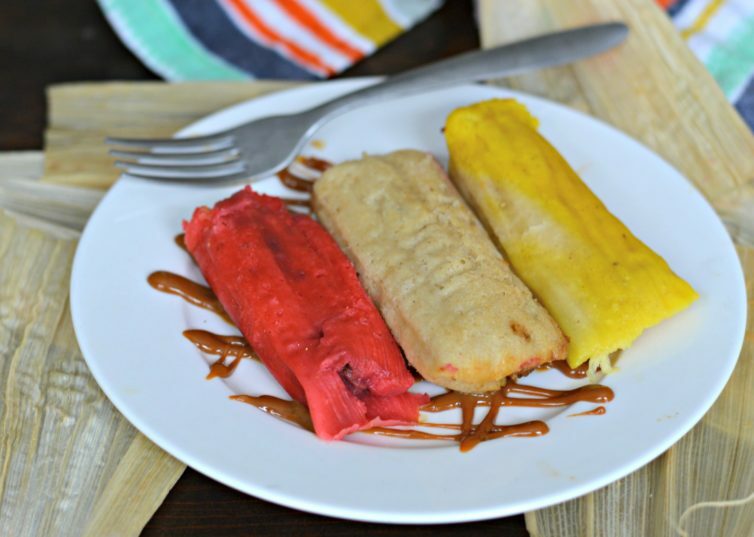 If you love Tamales, then you will want to try these three different varieties of sweet tamales as soon as possible. 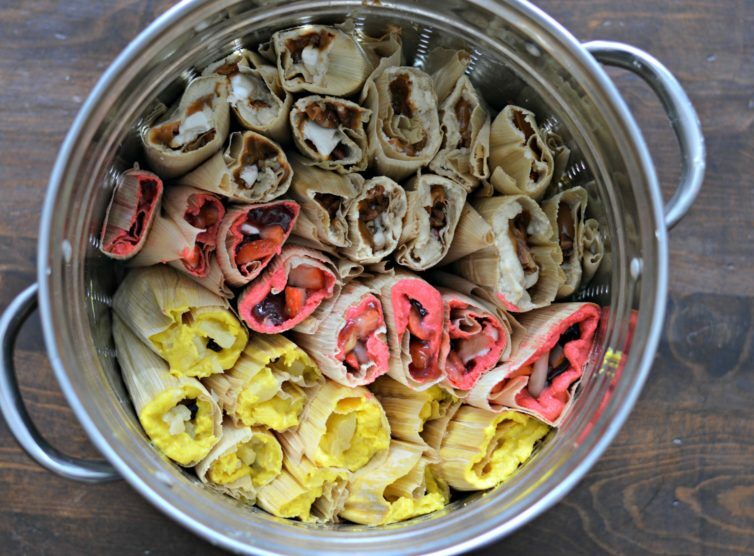 Soak the corn husks for tamales in water to soften them, and then drain the excess water. Combine all of the dough ingredients and knead until they are combined and integrated. If the dough is to moist at this point, add additional flour or dough. If it is too firm, then you can add a little bit of milk to soften it. Divide the dough into three equal parts. Add yellow food coloring to one of the parts, red food coloring to another, and no food coloring to the third. Knead with your hands until the color is evenly distributed. For the pineapple flavor, add some of the crushed pineapple to the dough and mix it in, flattening on the corn husk once you have finished. Then add the pineapple chunks in the center along with some raisins. Fold the pointy part of the tamal down slightly, and then roll the tamal up like a burrito. Place it top-side up in the steamer. For the strawberry flavor, add a small amount of the strawberry preserves, some chopped strawberries, and a tablespoon of cream cheese to the center of the dough, and fold as instructed above. Place in the steamer as well. For the dulce de leche tamales, add a tablespoon of dulce de leche, a tablespoon of cream cheese, and a few chopped pecans to the center of the dough and follow the instructions above. Cover the tamales with the remaining corn husks and add enough water to your steamer where it doesn't touch the tamales. Top with the lid and let cook in the steamer for 1.5 hours. Once cooked, let them cool a little bit and then unwrap and enjoy with atole or hot chocolate.